Monuments do more than just mark spaces in cemeteries. In Lakewood Cemetery in Minneapolis, Olaf, Christine and Effie Olsson rest near a large family monument with several meanings. The style itself – a stone that is half carved and half uncarved – symbolizes the transition from life to death. 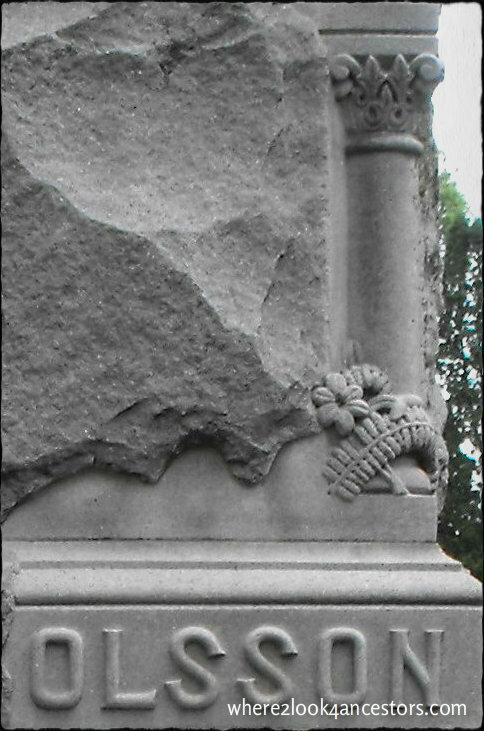 Closer inspection reveals a complete pillar with leaves and flowers. A broken or incomplete pillar or column generally signifies a life cut short or a sudden death. 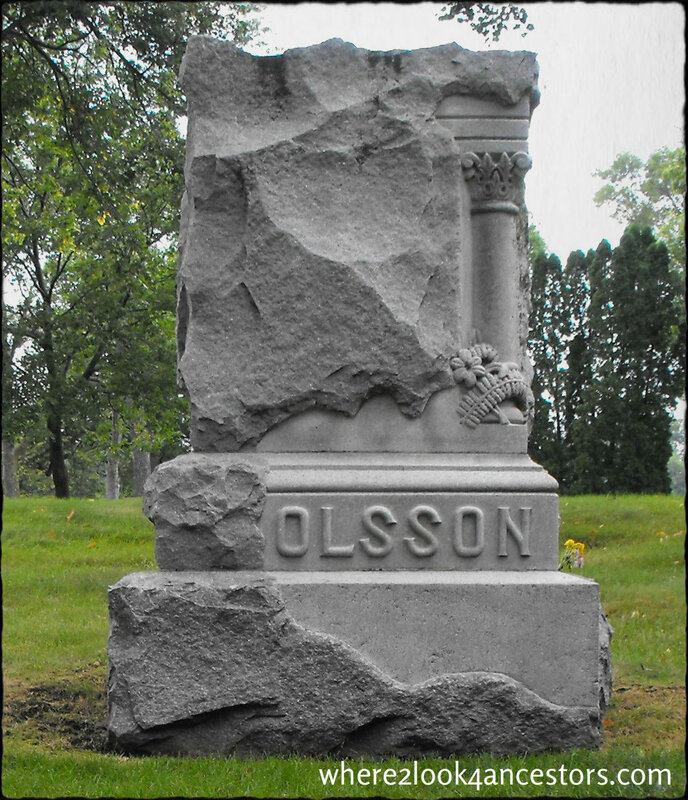 A column like the one on the Olsson marker has a top and a bottom. This can mean a full and complete life, steadfastness and/or the deceased’s support of/belief in heaven. The leaves at the base of the pillar are laurel which symbolizes spiritual victory. Open flowers, such as the one shown above, generally represent a belief in renewal in the afterlife. 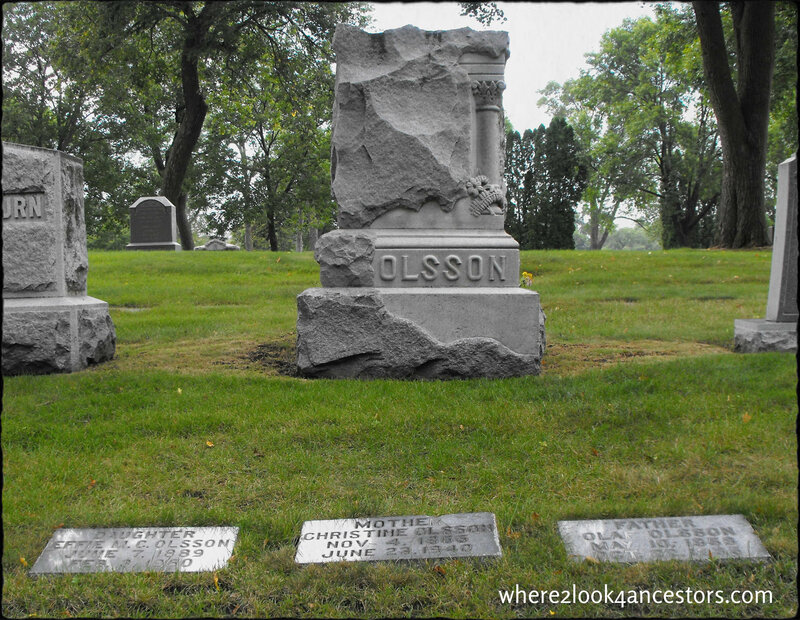 While census and other civil records show the Olssons’ occupations and socio-economic status, their final resting place tells us much about their religious beliefs. I just saw a monument almost identical to this the other day. It was HUGE, like 6 foot tall. One of the biggest in that cemetery! Cool! They are so interesting, aren’t they? As I learn more about the meanings behind the stones (and the stories beneath them) I enjoy my cemetery visits even more.